R.I.P. 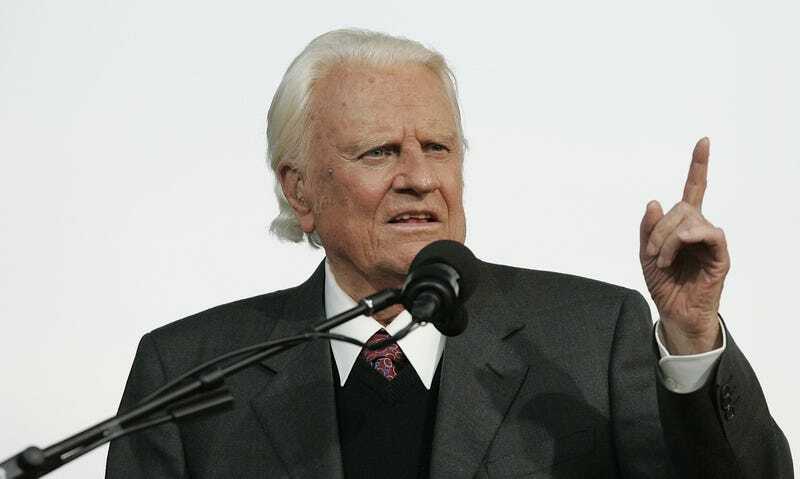 Billy Graham, "America's pastor"
Reverend Billy Graham, one of the most influential preachers of the last century, has died at the age of 99, The Associated Press reports. The Charlotte, North Carolina, native was born William Franklin Graham Jr. in 1918. He grew up Presbyterian but moved to evangelism and tent revivals in his teens. Graham founded the Billy Graham Evangelical Association in 1950, an organization that’s spread the word through radio programs, television specials, magazines, and websites. It’s a testament to how Graham embraced media throughout his career—he’s acknowledged the boost he received early on from William Randolph Hearst, who directed his many editors and publications to cover Graham. The minister took to writing an advice column, and later, dozens of books. But Graham’s preferred medium was definitely television—he hosted the Billy Graham Crusades from 1947 to 2005, and reaching hundreds of millions of listeners in hundreds of countries throughout his six decades in broadcasting. That decades-long tenure as a TV preacher helped earn Graham a star on the Hollywood Walk Of Fame; he remains the only practicing minister to have received one. During the civil rights movement in the ’50s and ’60s, Graham publicly supported integration—he wrote in his autobiography of the friendship he developed with Martin Luther King Jr., whom he met during the Montgomery bus boycott in 1955. The evangelical preacher famously bailed King out of jail during the Birmingham movement in 1966, but the two leaders held very different views of the Vietnam War, which led to a rift. King was critical of the U.S.’ involvement, while Graham, who’d long denounced communism, supported the military’s efforts. Graham, who was known as “America’s pastor,” was the closest thing to an official spiritual advisor this country’s had. He was invited to the White House by former presidents, including Jimmy Carter, Bill Clinton, and Barack Obama, but he was closest to Richard Nixon. That association burned Graham in 2002 and again in 2009, when the now-declassified Watergate tapes suggested Graham shared the disgraced president’s anti-Semitic views. On one tape, the minister agrees with Nixon that “Jews controlled the media”; on the other, he’s heard saying “the synagogue of Satan.” At the time, Graham’s spokespeople denied he was anti-Semitic, and pointed to his support of Israel. Graham was diagnosed with Parkinson’s in 1992; his failing health later led him to step back from regular ministering. His son Franklin Graham, also a Christian evangelist, has long served as the president of the BGEA. The reverend is survived by his children, grandchildren, and great-grandchildren.